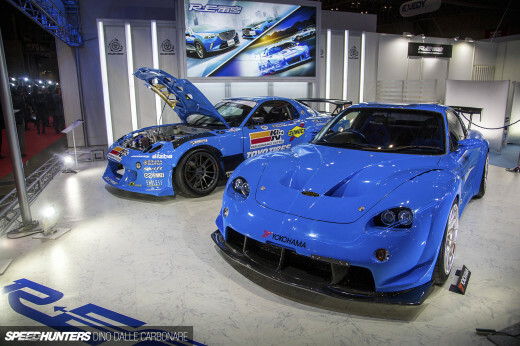 …much like Mad Mike’s FD at the Rays booth. 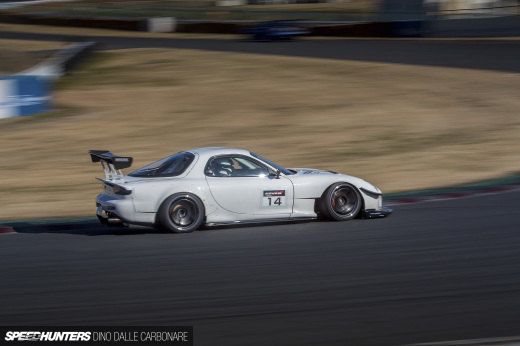 I found one of my favorite RX-7s on the little cornered off RH9 part of the show, the RE-Wing FD which was recently blasting around Tsukuba at the Super Battle event in December. 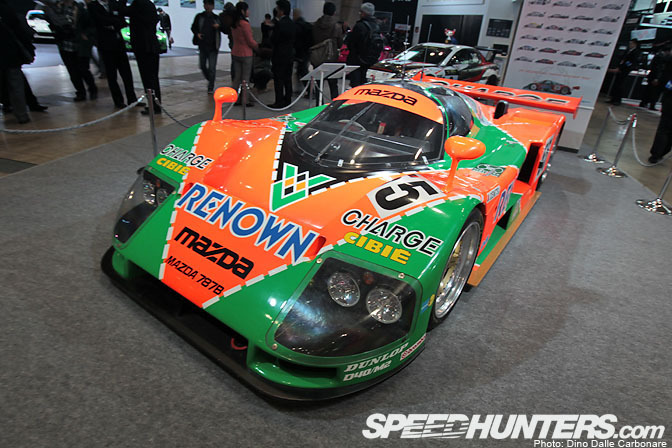 What makes this car special is that it can pull 57-second laps at Tsukuba, yet remains street-registered and legal. 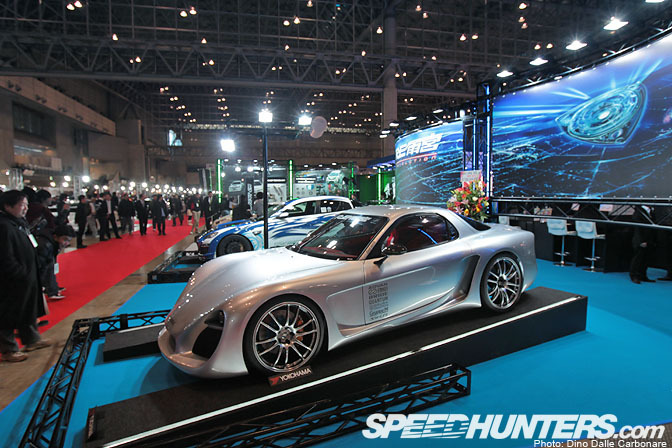 RE-Amemiya had quite a selection of cars, like every year, starting off with this collaboration built with Super Autobacs in Toda. The center sections of the hood venting were left unpainted, only a few coats of clear covering the exposed carbon fiber. 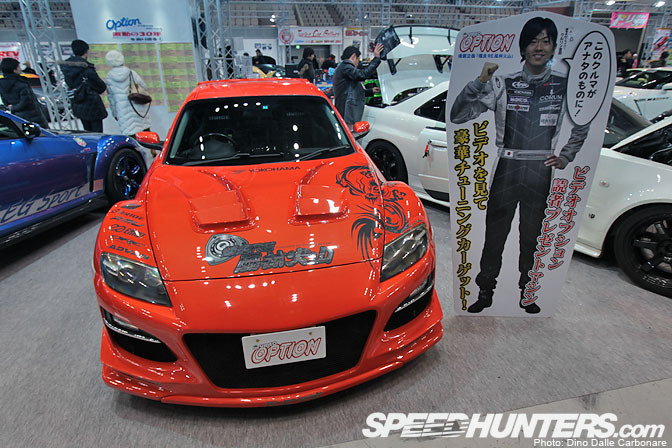 This RX-8 that was in the separate Option arena was another RE-Amemiya collaboration, this time done with Video Option. …a true one of a kind. Like a few other cars on display it is now up for sale. 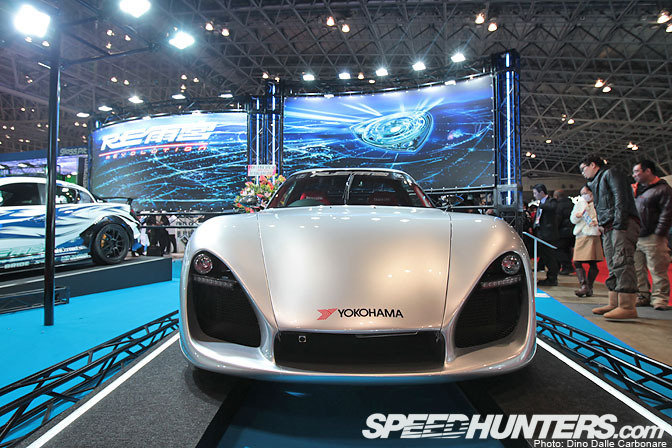 Last time I saw this Super GReddy 2 Ver.2 demo car was at Umihotaru PA back in July for the 7’s Day. Still, a great looking car. …which sports a few new carbon aero additions for 2012 like the front fender venting and trunk spoiler slash light surrounds. 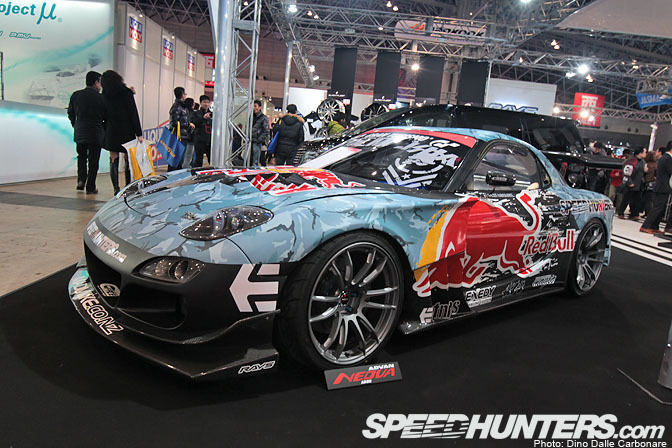 The 13B-powered RX8 will continue to be Suenaga’s D1 car this year. 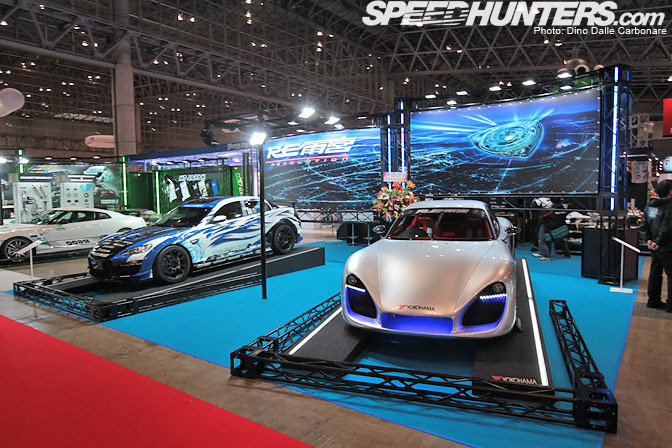 A look at the main display area for RE-Amemiya. 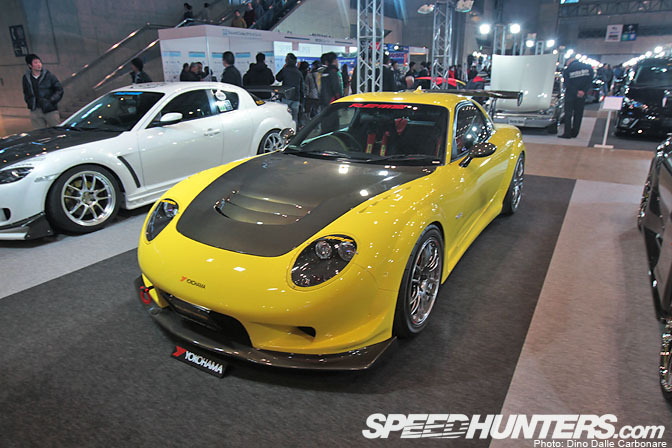 I’m sure most people didn’t know what to make of the Super NA7, it’s a very controversially styled car but one that resembles nothing Ama-san has done in the past. The wide body conversion has a very modern feel to it, lots of flow with plenty of nice details like the carbon mirrors and those massive 20-inch Enkeis that strangely enough don’t look like they are that big. One thing that you can always expect from Amemiya-san is great things in the engine department. With most of the front section of the car having been cut away to accommodate the design of the hood you are treated to a panoramic view of the motor. Rather than going for big power he preferred to go for a nice and compact solution, a peripherally ported 13B built with lots of nice race components. They haven’t had a chance to map the Motec engine management yet, but this little screamer should be good for at least 300 HP. 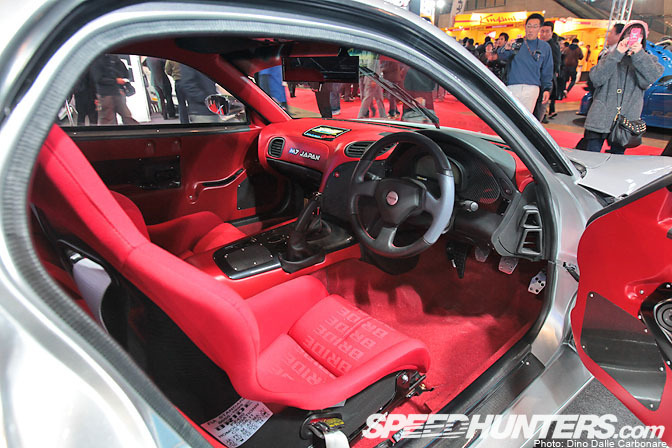 The interior is very simple, and very red! The rear end is all custom too, and really looks very special. 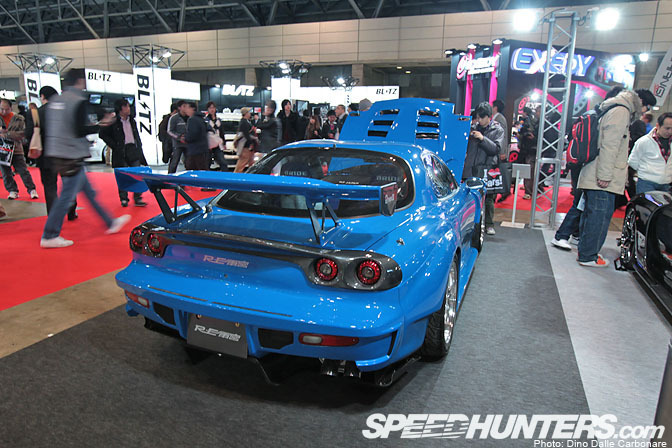 Ken Amemiya was telling me this might be the last FD show car they built, so what can we expect from them next year? 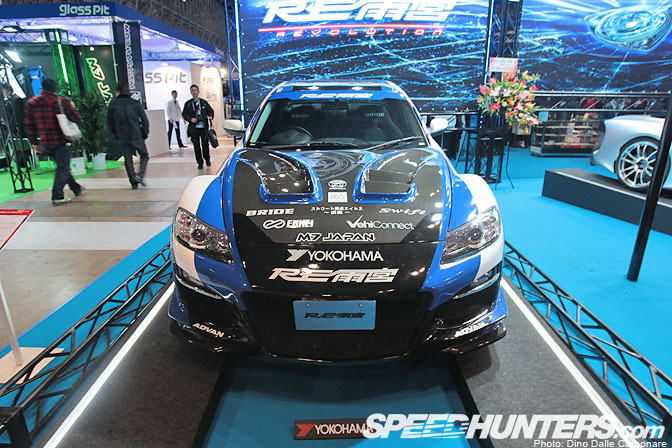 This RX-8 was also part of the display, a little ignored as most people spent their time around the NA7! …or the girl? I’ll let you answer that one. but hear it in action out during the motorsports exhibition. 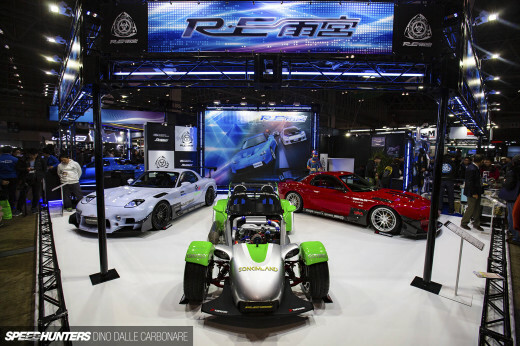 Right behind the 787 was the Knight Sports RX8 endurance race car that in the past participated in the Macau GP. 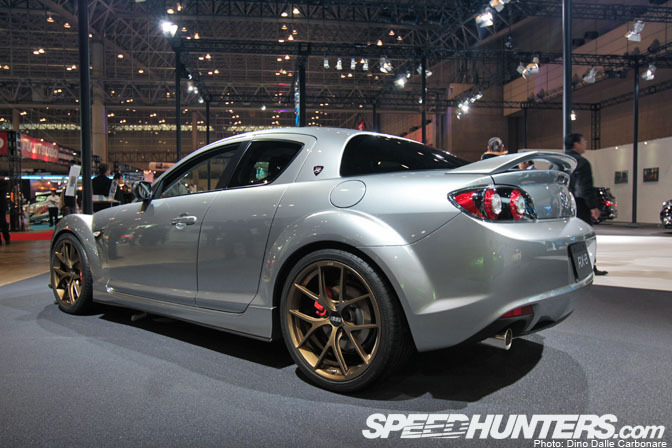 The final, limited edition RX-8 at the Mazda stand. 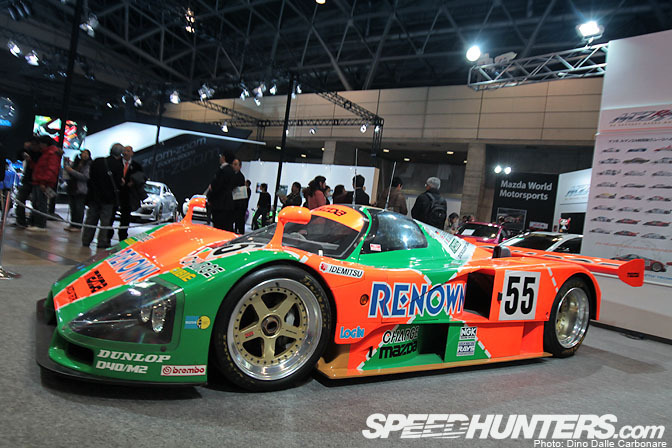 …and a complete TCP Magic wide body aero. 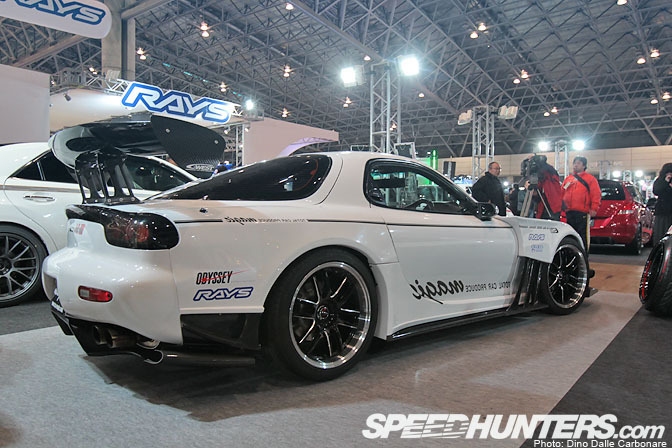 It’s the same kit that is fitted to their own demo car, the 4-rotor FD we have been seeing at shows, and the odd D1 event for years now. I’ve stopped guessing when we will see this car out in action. 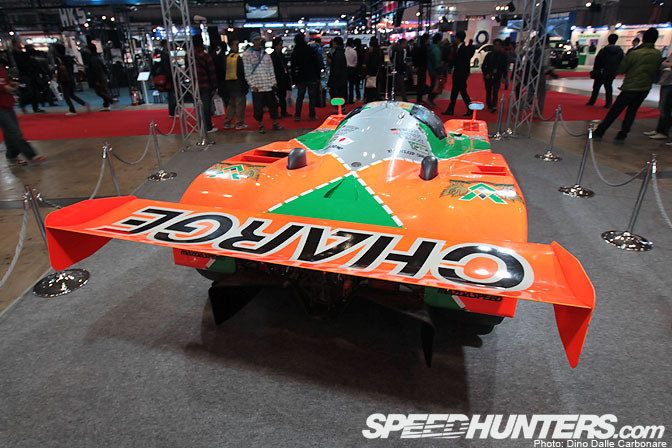 This was originally supposed to be Yoshioka’s D1 car, but there were a lot of delays in getting the engine set up properly. …the engine certainly didn’t disappoint. Boost is supplied by an HKS T04SBB, allowing the ported motor to crank out 430 HP through the HKS 6-speed transmission. 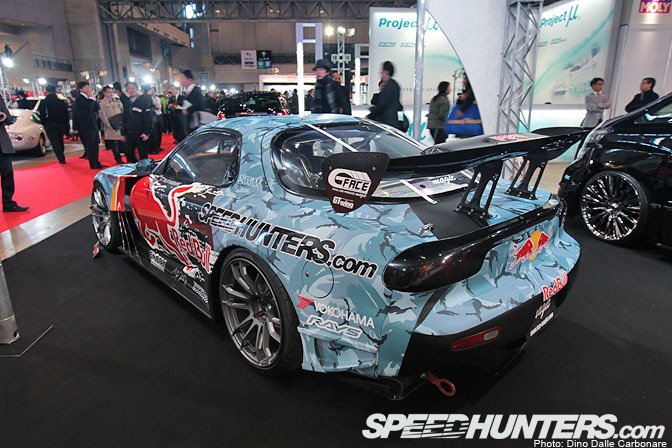 It was good to see that the RX-8 was getting so much love this year, and when it came to pretty wild body kits for it Weber Sports certainly took first place. Still loving the brushed metal finish on this car, however the bumpers and the rest of the plastic trim was probably vinyl. 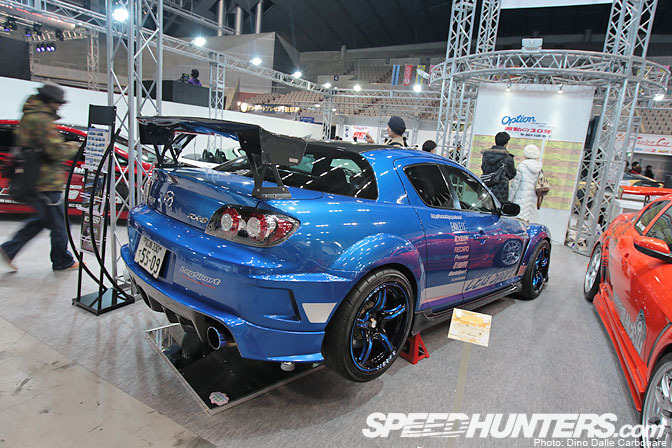 In the Option Tuning Car Gallery I came across the Leg Sport RX8, looking a track ready as ever. 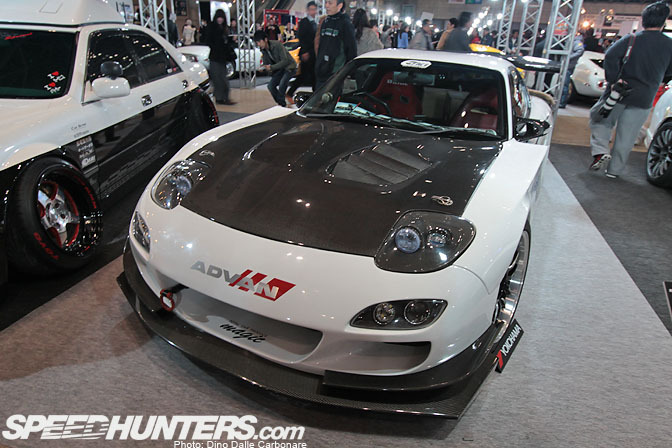 Another car we recently saw at the Tsukuba Super Battle, the recently improved FEED FD. 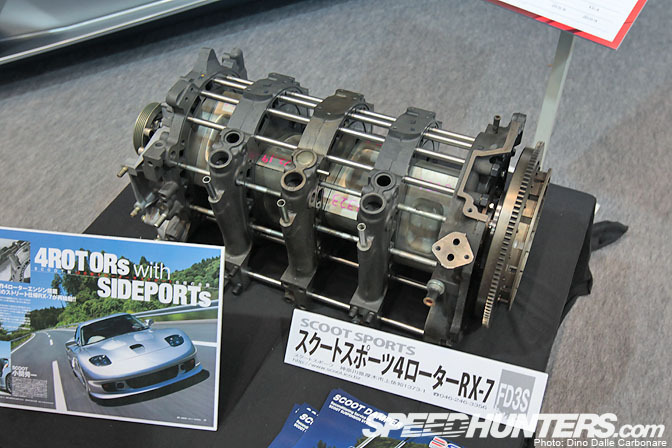 I only see Koseki-san’s Scoot 4-rotor creation once a year at the 7’s meeting. It’s cool that he has kept the car over the years, it’s his baby built as a one off so I can’t see him getting rid of it in a hurry. I have a video from circa 2005 of me sitting in the driver’s seat and revving the hell out of this crazy motor. What and experience that was, I’ll have to dig it out and upload it to Youtube! 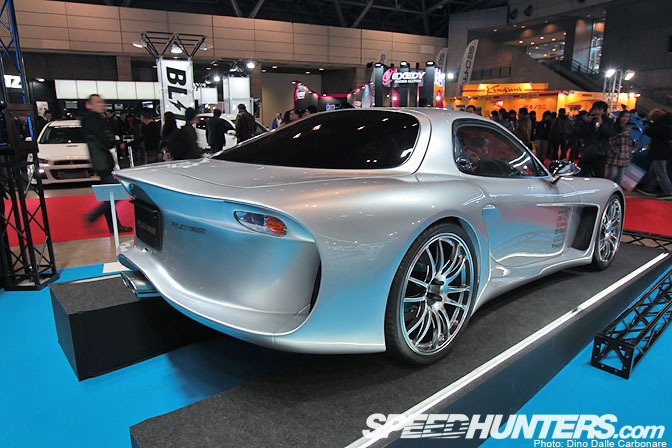 The Tamon kit the car is based on completely transforms the lines of the FD, especially from this angle. I’ll leave you with a picture of the Scoot custom 4-rotor engine that powers the RX-7. The housings are not present so you can see how the actual rotors sit around the eccentric shaft. I agree JamesC the pop up's are so iconic and cool, but the fixed clear ones look great as well. More wallpapers of the 787 please? Bit strange there never seems to be ANY Cosmo's around the circuit! Anyway. The TCP Magic demo car and the Scoot Sports 4-rotor RX-7 look great; and you should really upload that video. I have seen every clip on YouTube of that car, hehe. There are some pretty amazing cars in this gallery. Its making me want to sell my FC for an FD, or Rx-8. That last car is INSANE!! I love it! Also, I can't wait to see Mad Mikes new car in action. 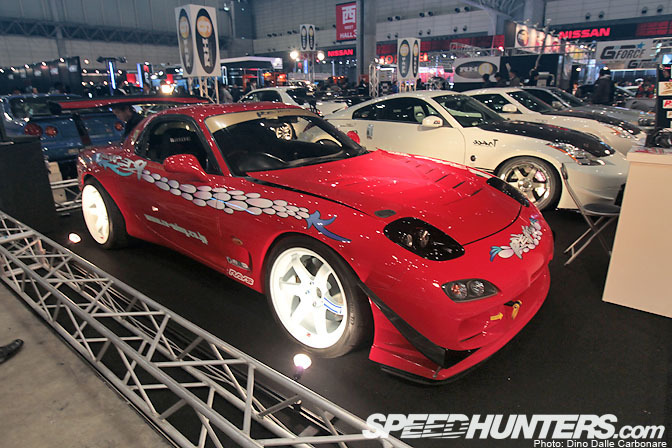 The FEED FD looks amazing too. Great post Dino! good to hear that Ama-san is going to stop ruining FD's.. 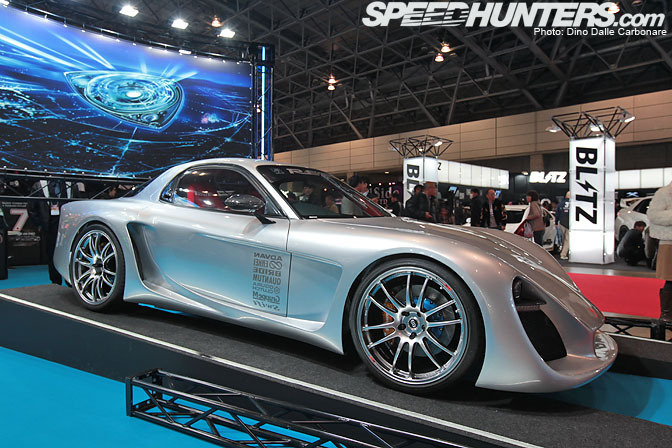 Sad to think this time next year there wont be any rotary's in production! Very very very nice Dino! Incredible shots as usual, and you know this warms my heart more than anything. 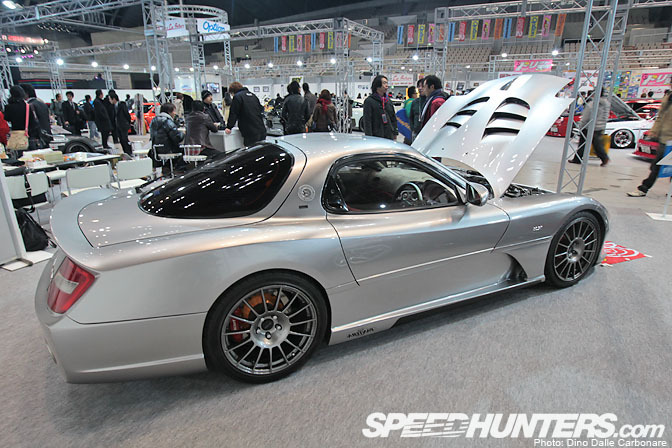 I love how Euro styling has worked its way into the aftermarket for the FD. More than once I saw a car that reminded me of German. 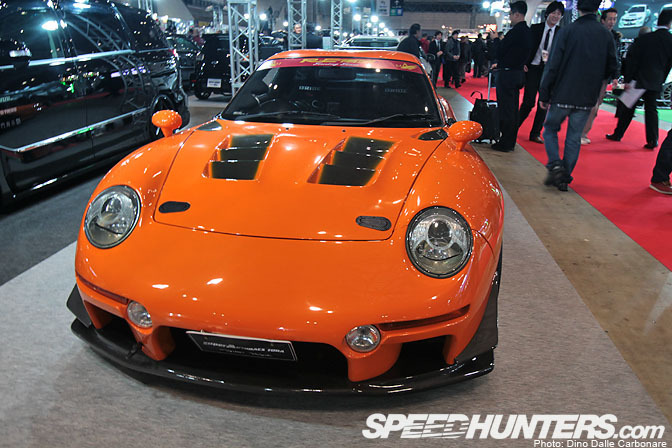 Man...that Super NA7 is really starting to grow on me. Love the profile...Love the rear end...Starting to love that front end. 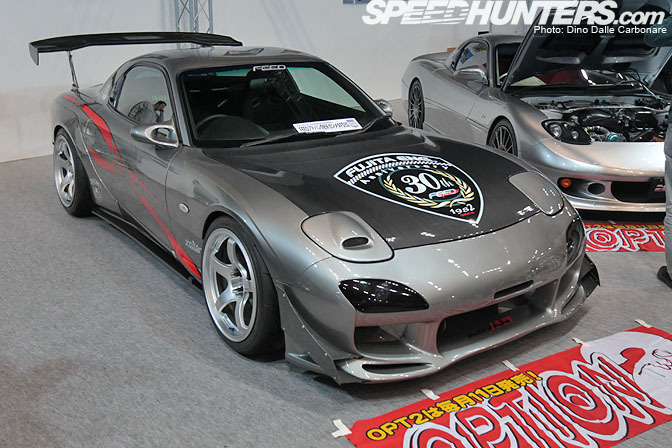 Love Rotary cars, and I actually like Re-Amemiyas latest FD-creation, and also Koseki-san´s FD! Thanks Dino, very impressive group of rotarys. My favorite post! 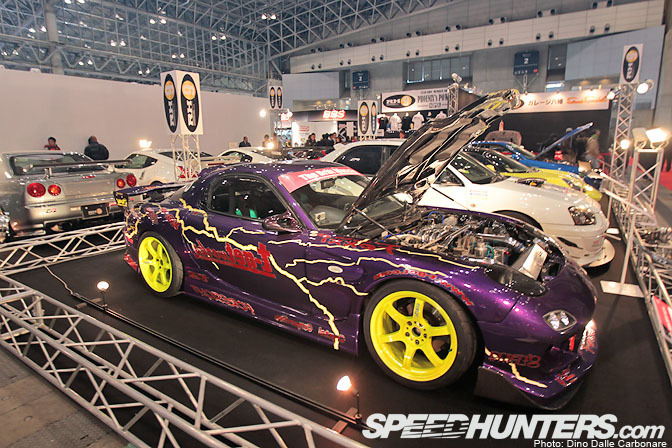 Spotlight on that NA7!!!! 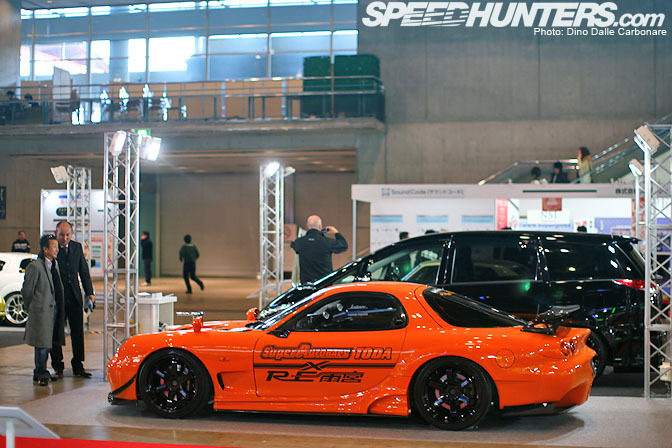 I love the custom bodykits for the Rx-7's. The fact the bodystyle is so old yet with these kits they make it still fresh to me is great. 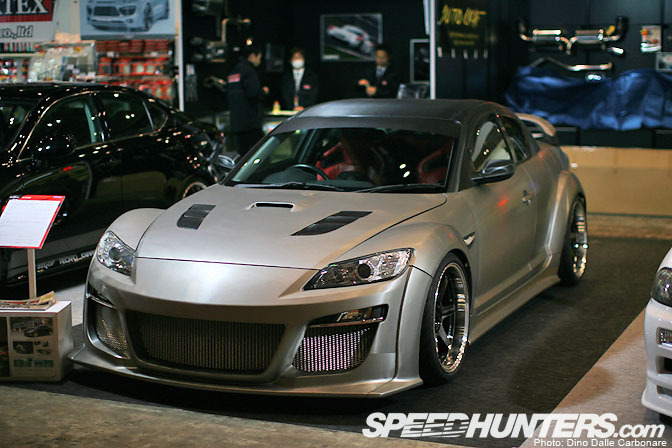 I'm hoping sooner rather than later similar styled kits will start to pop up for the Rx-8. I kept scrolling in hopes to see any FC's or FB's. I need new inspiration. Cant wait to see what succeeds the current RX line up. So glad you posted these Dino. Thanks for doing coverage for us Rotary guys!!!! 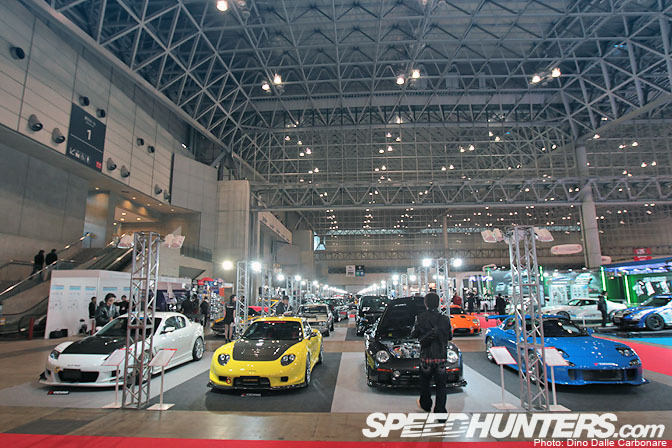 SPEEDHUNTERS ROCKS!!!!! Anyway, great coverage as usual. Need a spotlight on Na7, good coverage. 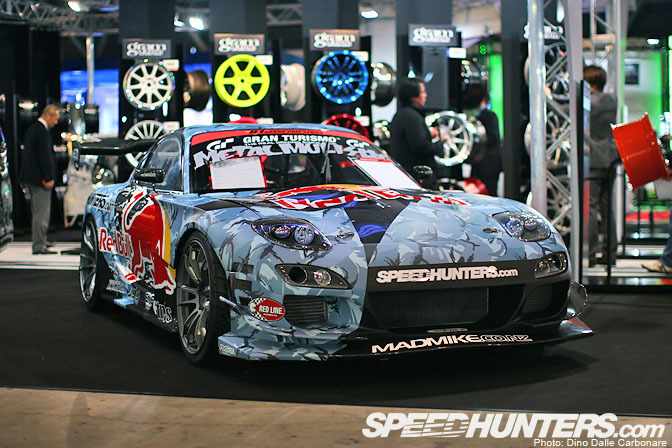 so is madmike representing Gran Turismo or sponsored by them? i hope USA get more rotary products so i can learn more because i just got in to rotarys and i'm getting really enterasting.